Many people would love to travel more but are afraid of leaving the comfort of their own homes and facing the scary world outside. There are a lot of things that cause fear and that can make some people put off a trip indefinitely. For example, you may wish to go to an exotic place, but you may also be afraid of snakes. What if you come across an anaconda or a python? What is the difference between these two anyway? the Bolivian anaconda (Eunectes beniensis). A regular sized anaconda is 12 inches in diameter, can grow up to 30 feet long, and weighs about 550 pounds. It lives in swamps, marshes, and rivers. The anaconda has eyes and nostrils on top of its head. This allows it to see above water while the rest of its body remains submerged. The anaconda can eat any animal it manages to subdue. As animals come to the water to quench their thirst, the anaconda watches them from beneath and launches a swift attack. Before the animal can struggle and get free, it is pulled into the water and drowned. The anaconda then swallows it. An interesting fact about anacondas is that they lay eggs and give birth! How is this possible? The eggs are laid inside the body and then the baby snake comes out of the body when the egg hatches. One good explanation for this would be that anacondas spend a lot of time in the water and this is not a good environment for eggs. The lifespan of an anaconda in the wild is 10 years. In captivity, however, they can live up to 30 years. A python is a snake belonging to the Pythonidae family and the Python genus. There are 41 species of snakes in the Pythonidae family and they all live in Asia, Africa, or Australia. Their sizes vary from 24 inches in length – the smallest python snake being the anthill python (Antaresia perthensis), to 30 feet in length – the reticulated python (Python reticulatus). The pattern on the python differs from one species to another and it varies according to the type of environment it needs to blend into. Pythons are terrestrial or arboreal creatures. They crawl on the ground or they spend their days curled around the branches of trees. For their prey, they prefer small mammals and birds. They lure the prey in by staying perfectly still, then they pounce, grab it with their long, sharp teeth, and draw it in. The prey is then killed by constriction as the python wraps around it and squeezes tighter and tighter. Females will lay eggs in nests they build on the ground or in abandoned burrows. Once the eggs hatch, the mother does not look after the babies. The natural lifespan of a python in the wild is 25 years. In captivity, it can live up to 35 years. Some people keep pythons as pets. 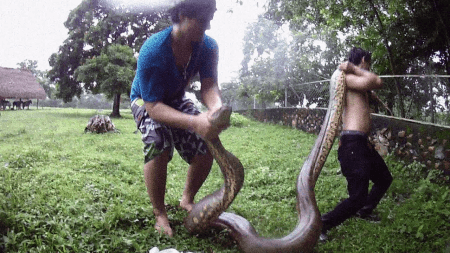 So what is the difference between an anaconda and a python? The anaconda and the python are both giant snakes. However, the anaconda is the heaviest snake, while the python is the longest. Therefore, even a smaller anaconda will weigh more than a longer python. Also, there are 4 species of anacondas and 41 species of pythons. As far as distribution is concerned, the anaconda lives in South America, while the python lives in Africa, Asia, and Australia. The first prefers an aquatic environment – swamps, marshes, and wetlands, while the later is a terrestrial or arboreal creature. Their methods of attack and subduing their prey differ. The anaconda stalks its prey from bellow the water, attacks, and drags it in to drown. The python lays perfectly still, attacks, draws the prey in, then wraps itself around it and crushes it. Their choice of prey differs also. An anaconda will eat almost anything it can subdue – even crocodiles – while the python will mainly go for small mammals and birds. Another important difference between the two, one dictated by each snake’s environment, consists of the way they reproduce. Anaconda females will lay eggs inside themselves then give birth to the hatched snakes. Pythons will make a nest, lay eggs, and only stay with them until they hatch. The lifespan of an anaconda in the wild is 10 years. A python, however, can live up to 25 years. In captivity, an anaconda can live up to 30 years, whereas a python can live for 35.